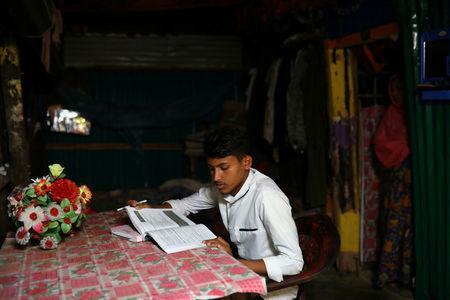 COX'S BAZAR, Bangladesh (Reuters) - Sixteen-year-old Kefayat Ullah walked to his school in southern Bangladesh in late January, as he had done most days for the previous six years, to find that - despite being one of the top students in his class - he had been expelled. For years, Bangladeshi schools have quietly admitted some of the Rohingya who live as refugees in sprawling camps on the country's southern coast, and whose numbers have swelled to more than 1 million since violence across the border in 2017. But the new influx has tested the hospitality of the Bangladeshi government, leading them to apply tighter controls on the population. Bangladesh's Prime Minister, Sheikh Hasina, meanwhile, has said the country cannot afford to integrate them. The government has also forbidden centers in the camps from teaching the Bangladesh curriculum, according to the U.N. children's agency, UNICEF. "We are very sorry and disappointed about the decision," said the principal, Jamal Uddin. "The government is providing everything for the Rohingya – why not education?" "How do you think I feel?" he said. "We don't mind the Rohingya, but we mind our lives." But many children and their parents say the hundreds of learning centers operated in the camps by international NGOs and the U.N. offer mostly unstructured learning and playtime. Bob Rae, Canada's Special Envoy to Myanmar, who has also traveled to Bangladesh, said Bangladesh authorities including Sheikh Hasina "have emphasized that the refugee camp is supposed to be 'short term' and that to talk about schooling beyond learning centers for very young children would risk giving the impression, to Myanmar and the world, that camps were there to stay". "There are many Rohingya who can't get the Myanmar curriculum – we are doing this so we can help them," said 20-year-old Nurul Ansur, the Bangladeshi proprietor of a print shop which specializes in copies of the textbooks, pulling a copy of 'Grade One Primer, Basic Education' from a filing cabinet. "Bangladesh wants to see us a good community," he said. "Also the U.N. wants to see us a good community, but if they block our education, how can we be?" Kefayat Ullah had dreamed of graduating and becoming a journalist "to help our community". Now, he watches his Bangladeshi former classmates travel to and from class in their crisp white shirts.